Night shining clouds imaged 1:30am July 2007 by Anne Hourston in the Scottish Orkney Islands. They are Earth's highest clouds, 50 miles high and close to the immensely cold mesopause. They are in summer sunlight while the dark tropospheric clouds a mere 1-3 miles high are in night. ©Ann Hourston, shown with permission. 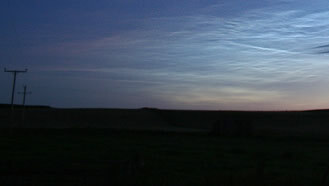 The short summer nights of latitudes of 50 - 65° reveal the highest clouds - noctilucent or ‘night shining’ clouds, NLCs. They are colourless or bluish-white. They can be skein-like, rich with undulations, currugations, knots and streaks clawing upwards into the sky, at other times they lie close to the horizon as a featureless band. The clouds are seasonal. Look for them from mid May to mid August (mid-November to mid-february in the Southern Hemisphere). They are never visible in daylight. Wait until an hour after sunset when twilight has deepened. The sun should be 6 - 16° below the horizon, enough to darken the sky but not so low that the NLCs are not still in sunlight. Search first of all low in the sky towards the direction of the sun beneath the horizon, northwest before midnight, northeast afterwards. Avoid moonlit nights when lower clouds and especially cirrus are lit white against a darker sky. Binoculars help in distinguishing them from lower cirrus clouds because under magnification they appear sharper. NLCs are seen further south. They have been sighted in Europe as far south as Austria, Hungary, Italy and southern Germany. In the US they have been seen in Utah and Colorado. Noctilucent clouds remain sunlit even when the sun has long set and is 10-15° below the horizon at sea level .